Poverty among public school students: More than half are low-income. 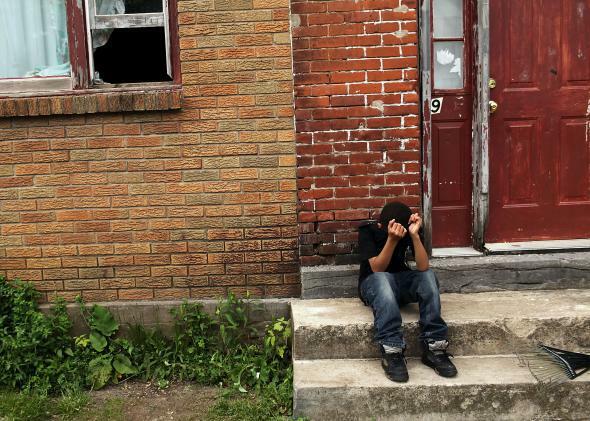 A child sits on a stoop in Utica, New York, where the poverty rate is 35 percent. You can argue whether poverty is the single biggest problem facing America’s public schools. But it is an undeniably enormous, and growing, challenge. This week, the Southern Education Foundation reported that 51 percent of students in grades K through 12 received a free or reduced-price school lunch in 2013, meaning that their families lived on less than 185 percent of the poverty line. According to the Washington Post, it is “the first time in at least 50 years” that more than half of the country’s public school kids have qualified as low income. In 1989, the figure was under 32 percent. In 2006, it hit 42 percent, and by 2011, it had ratcheted up to 48 percent. The point being, this is not just a temporary matter of the recession setting back American families. It’s a long-term trend that educators will be forced to grapple with for years to come. Over time, the rise of single-mother households and the growing share of immigrants among public school students has reshaped the socio-economic profile of our schools, creating challenges for teaching and learning that weren’t so severe 25 or 30 years ago. The prevalence of low-income students varies across the country. More than half of students qualify for free lunch in 21 states now, largely in the South and West. 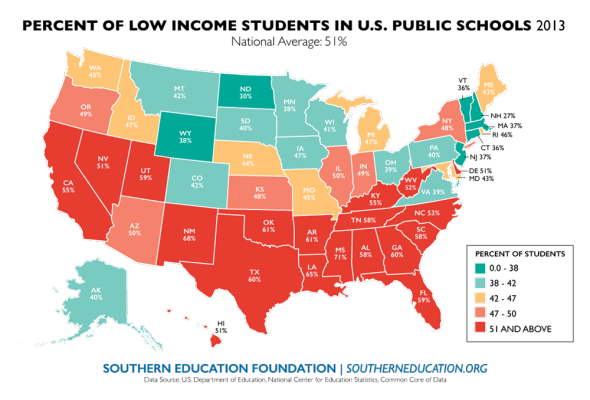 The problem is most severe in Mississippi, where 71 percent of students are low-income, and least severe in New Hampshire, where the number is just 27 percent. But ultimately, in all but two states, at least one-third of school children are now qualified for the free lunch program. In light of those facts, it’s somewhat remarkable that U.S. students have been moderately improving their overall performance on national standardized tests in recent years. Low-income students start off less prepared for school and have difficulty catching up as they age. So it’s a credit to our education system that kids are making even slight progress, despite their declining circumstances.